I went to visit my parents last week – well, actually, I went to visit the cutest new puppy in the world, Teazel – and came back with a huge carrier bag of blackcurrants (and some over-enthusiastic dog inflicted chew marks, but I forgive her). I remember being struck by a blackcurrant leaf sorbet I came across at Ballymaloe, which made me realise that the leaf itself is almost an echo of the scent of the fruit; it smells of crouching to collect the berries with a plastic container and the sun on your back, verdant and winey. If the leaf sorbet tastes of the promise of future harvest, with a bag of ripe currants I wanted a sorbet that would capture the taste of late summer bounty. 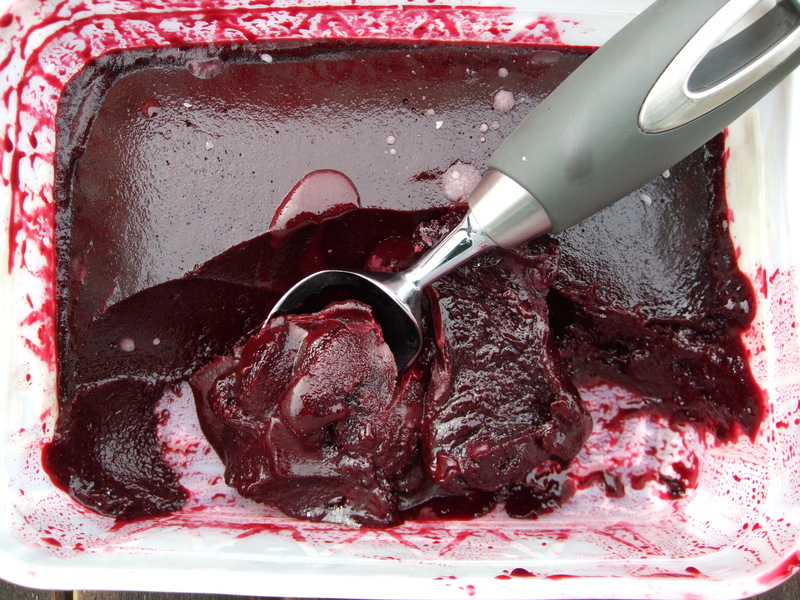 I wanted to distil pure blackcurrant essence into a sorbet. And, not to blow my own trumpet, but I succeeded. This thing is so heady with flavour it’s difficult to eat very much of it – a bit like drinking neat Ribena, but less sweet and with a more beautiful colour. Blackcurrants rival beetroot for the most lovely of food hues, I think (and the most messy stains left in the kitchen). So most of the credit for this actually belongs to Roger Verge, whose recipe for raspberry sorbet I used as my guideline. The fruit isn’t cooked, so it tastes fresher, as if it’s just been picked. Enough sugar is added to enhance the taste without messing about with it – I increased the amount only slightly from the raspberry recipe, so it’s not too sweet (but neither is it sour enough to make your mouth pucker). The perfect sophisticated finish to a summery meal. First, I highly recommend putting on an apron. There will be purple juice everywhere. Next, puree the blackcurrants in a blender – don’t worry about topping and tailing them as the next stage will remove any debris. Press the puree through a sieve, getting as much as possible out. This will involve some quite hard work with a wooden spoon. Add the sugar and lemon juice and whisk to dissolve. Taste to check the sugar levels – remember it will taste less sweet when frozen, so you want it to be a tiny bit sweeter than you’d ideally like. Churn the sorbet in an ice-cream machine until fairly firm – I found it didn’t freeze as much as ice-cream, but the final texture was still good. Decant into a tub and freeze until solid. It doesn’t seem to need long out of the freezer before becoming scoopable, which is a bonus – as is the fact that, because of the robustness of the flavour, it should last longer than a normal sorbet without the taste dulling. DAMN this is good. I know I wrote about chocolate ice cream not so long ago, and that was good too, but this is a different creature altogether. Stomach-groaningly rich, like the purest, creamiest frozen chocolate truffle. It has luxury written all over it in metaphorical gold plated lettering. You may struggle to eat even a moderate sized bowlful (but you will probably succeed). 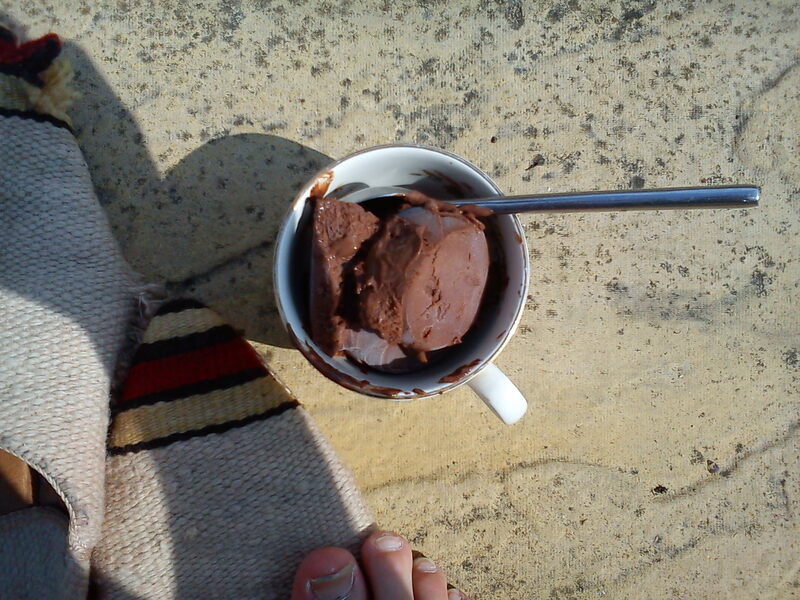 Well, Fergus Henderson does rather throw down the gauntlet by claiming that this is ‘the perfect chocolate ice cream’. Luckily, you will agree, because you will be far too full for picking up anything, gauntlets or otherwise. And now the bad news: it takes a week to make. Wait! Doesn’t delayed gratification make things taste even better? Perhaps this depends on whether you’re the sort of person who likes to give themself kitchen projects. I first read about this incredible sounding, calendar-requiring ice cream on Seven Spoons and was committed to the idea straight away (from which you can infer that I am). Shortly afterwards, fate delivered ‘Beyond Nose To Tail’ into my hands via my local Oxfam. It’s a great book, full of wise instructions such as ‘be firm, but fair with salads’. I skipped through the pig’s head and trotter sections, because I’m a faint-hearted girl, and straight to puddings (including the sub-division ‘steadying puddings’) and baking and ice cream. Oh joy! There it was. It’s not actually time consuming to make, but you must mobilise will power and leave it in your freezer for a few days before eating it. It makes a difference: on the fourth day, to rescue a disappointing dinner of pizza overly charred on the barbecue, it tasted even better, the caramel notes issuing forth more confidently. We finished it there and then. Time to buy some more chocolate and hope the weather holds out for next week. Break the chocolate into squares and melt in a bowl over a pan of hot water (or in a microwave, if you have one). Beat the egg yolks and caster sugar until pale and thick, enough to trace a figure of 8 on the surface. This will take around 5 minutes with an electric beater/whisk. Bring the milk, cream and cocoa powder to the boil slowly in a large pan, whisking to disperse lumps and prevent the cocoa powder sticking on the bottom of the pan. Pour this over the egg yolk mixture, whisking to mix evenly, then put it all back in the saucepan and scrape in the melted chocolate. The recipe now says to cook over a low heat for a further 8 minutes, but mine was already very thick so I left it on the heat for much less time, a couple of minutes perhaps. It should coat the spoon thickly, but obviously you want to avoid the eggs scrambling. When you’re happy with the custard, remove it from the heat. Make the caramel by bringing the sugar and water to the boil. Keep the heat low at first, stirring the sugar to dissolve it, then raise the heat and don’t stir until the mixture is thick and chestnust brown. Quickly pour the caramel into the ice-cream base, whisking vigorously. Pour everything through a sieve into a plastic container and cool it down in an ice-bath. When cool, leave in the fridge for 2 days before churning in an ice-cream machine. After churning and freezing, leave for 3-4 days before eating.